Red foxes live in most of Asia, Europe, and in the northern parts of North America. Gray foxes live in most of the United States, Mexico, Central America, and in parts of South America. Foxes are found in farmlands and forests, deserts, and in wooded areas of some cities. They live in family groups while they are young. Adults live alone or in pairs. Foxes do not live in packs like wolves do. Foxes live in dens during the winter. The den may be underground, in caves, among rocks, or in hollow logs or trees. Foxes are skillful hunters. They eat almost any animal they can catch. Foxes especially like mice and other kinds of rodents. They also hunt birds, frogs, insects, lizards, and rabbits. Most foxes eat many kinds of fruits. They may even eat the remains of a dead animal. Foxes hide their uneaten food by burying it. They hunt mostly at night. What if they live near your home? 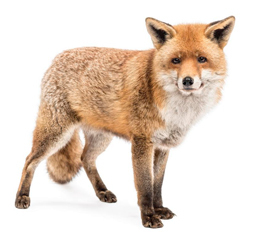 Problems associated with foxes include depredation on small livestock such as, chickens, rabbits, and young lambs, and their potential to carry disease organisms. Small domestic animals may also be preyed on. Sometimes a fox will dig dens around residential areas, they may also dig holes under fencing or buildings to gain entry.If you need fox removal services, call Shumaker”s animal control anytime 443-854-8072. Foxes are normally extremely wary of humans and are not kept as pets.